Wow, we can truly say that a wedding at The Reeds in Stone Harbor looks gorgeous anytime of year! Despite the chilly November temps, The Reeds was the perfect venue for this coastal chic Black Tie wedding. Alyse had some serious style with her Hayley Paige Dress and fringed leather jacket by Rebecca Minkoff. 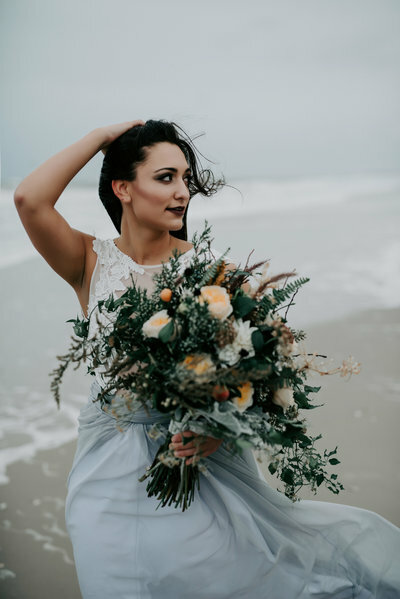 Her bridal look was created by Makeup artist Emily Dann Esthetics and beachy waves were perfected by Mary-Ashanti of Madeup on the Go. Floral and Event designer Fete Urbane outdid themselves with the eclectic bouquets in muted fall tones, perfect for the bay front venue. After getting ready with their respective bridal parties, Alyse and Matt shared an intimate first look. We took some fun pictures with the bridal party around downtown Stone Harbor before whisking the bride and groom away for a romantic beach portrait session. The ceremony took place right before sunset and it could not have been more beautiful! Dreamy light illuminated this ceremony as Alyse and Matt shared their heartfelt vows. We soaked up the last drops of light to get some final portraits of the bride and groom on the dock as they were now officially man and wife! Congrats on such a beautiful wedding at The Reeds Alyse and Matt! If you loved this wedding, also check out this Coastal Chic Wedding at The Reeds.